Seeing you in action is a joke! How not to honor, here on Neo Geo Kult, the game by which it all began. 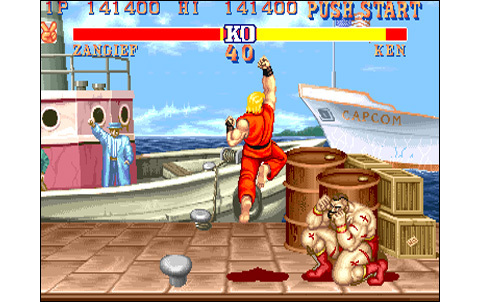 The rivalry between Capcom and SNK, as all fans of fighting games have always known, is partly born with Street Fighter II. This legendary title is nothing else that the game that laid the foundations of the VS fighting genre in 1991. 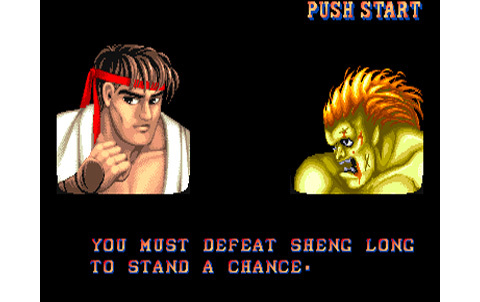 Indeed, in the past, Capcom and SNK have little exploited this kind of game, stammering, with only two quite mediocre titles: Street Fighter, for the first one, and Street Smart for the other. Both games were really no good, Capcom's one featuring a crappy animation and a catastrophic gameplay, while the other one wasn't offering any special move and no possibility to fight between humans (one or two against the CPU only). 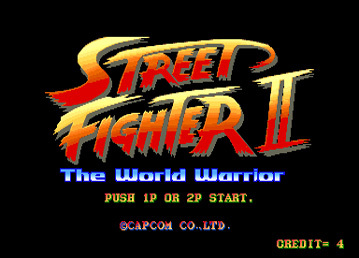 Things have changed, and now Capcom declares war this very year, with a production that will mark forever the arcade world. 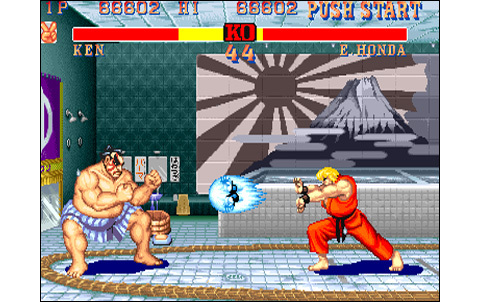 For the first time in a fighting game, Street Fighter II offers to choose from eight characters. And that, was a huge roster! At the time, it's simply astounding, simply the absolute reference. 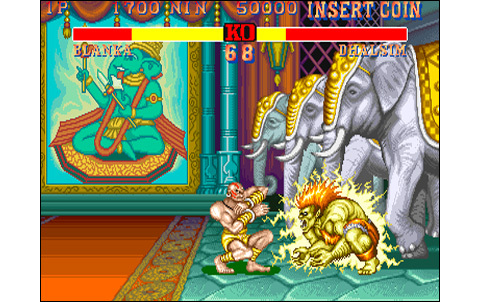 Each character has a good variety of moves and amazing special ones: fireballs, thousand hands, throws, electricity... 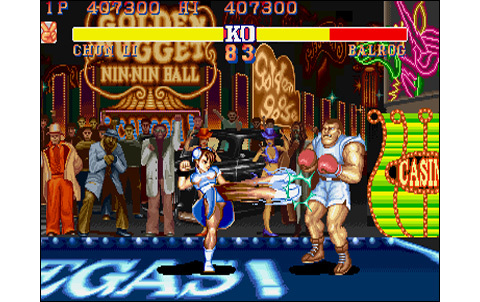 The game is a wealth of discoveries and each part makes you want to see more and try other fighters... The recipe works! And that is nothing of a coincidence. Capcom particularly refined his game, everything is licked, starting with the realization. Graphically, it's a wonderful trip all around the world. 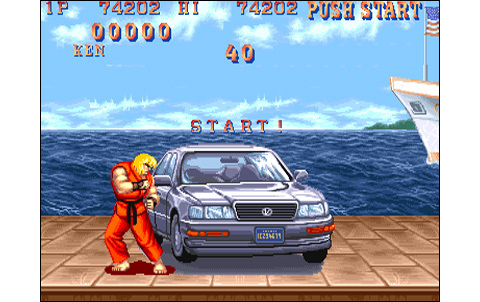 Most os the stages are looking fantastic: Ryu's home and the sunset, Guile's F-16 on the military basement, the lively Chinese village of Chun-Li... The ground is modeled with fake 3d, using line by line scrolling , providing a nice effect of depth to the game. The backgrounds are for the most colorful and lively, with spectators gesticulating or clouds passing by. Animation is suprisingly smooth and decomposed compared to what we've seen until then, probably standing as the best of its time. 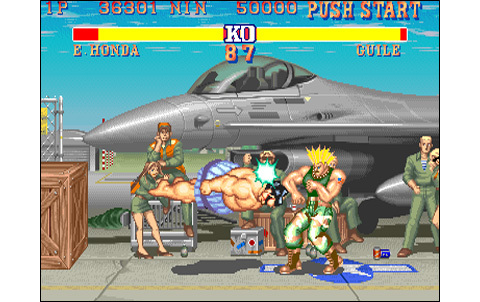 Detail have been greatly worked, there's even a slow motion occuring when one of the fighters is knocked out. The musics, now became super famous tunes, are brilliantly composed, melodic, catchy. These stick in the mind of players, and never go out . The tracks get a faster tempo when a fighter is close to KO, which is another great idea! In addition to its revolutionary gameplay, which is the strength of the game, Capcom allowed huge attention to details. 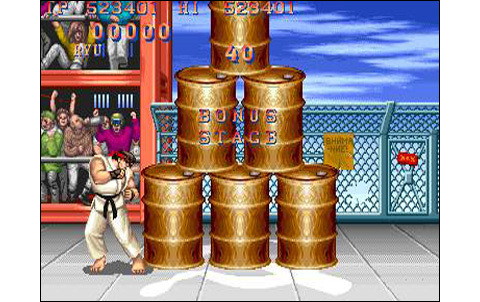 Intermediary screens are nice and pleasants, bonus stages very fun and break the monotony; elements of sets are destructible, four bosses appear only after we have defeated the seven other opponents. The first time, it was quite a surprise! Capcom's graphists and programmers haven't forgotten any detail, and in the end, every detail in the game is remarkable. Speaking of gameplay and replay value, it comes close to perfection. 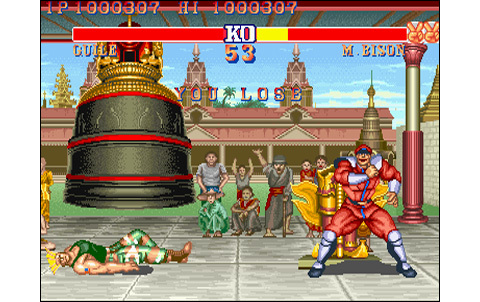 Since many fighting games did much better after 1991, at the time we could hardly imagine that SF2 would be surpassed. Six buttons were used: three for punches, three for kicks. It's pretty comprehensive, even useless for some characters which can be perfectly exploited with three or four buttons. 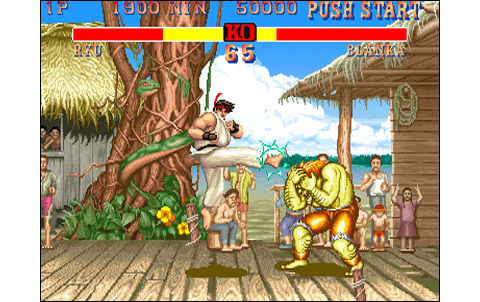 Each one packs about twenty different moves, including throws, specials and fireballs for some. 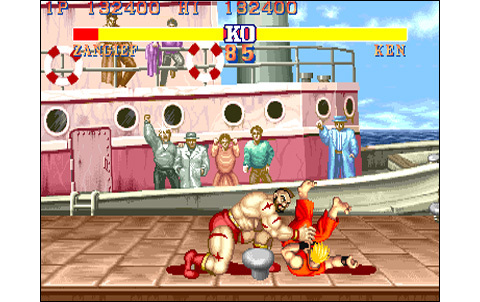 It's really good, so good that for the next SF games, Capcom will add very few new moves. Some combos can be performed too. 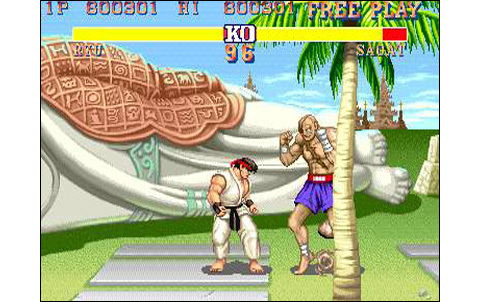 In terms of criticisms, one can simply regret that the life bar goes down a little too fast, or that characters were granted too large hitboxes. It also remains that the CPU is sometimes obnoxious, when it has "decided" not to let you win! 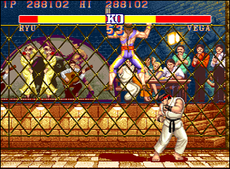 Another flaw is that some clashes are very unbalanced, and a few fighters much weaker than others. 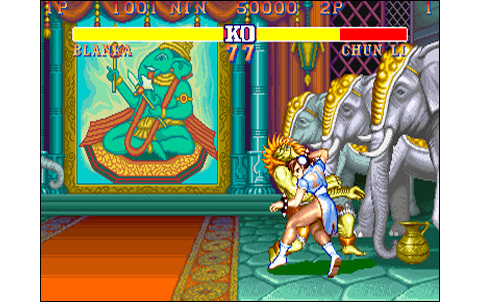 It often happened in early fighting games, but blatant here. Anyway, the replay value is remarkable. One player mode will have you beat eleven opponents, and it will not be a sinecure. For two players, it's as enjoyable as any good game like this, multiplying the fun factor tenfold. 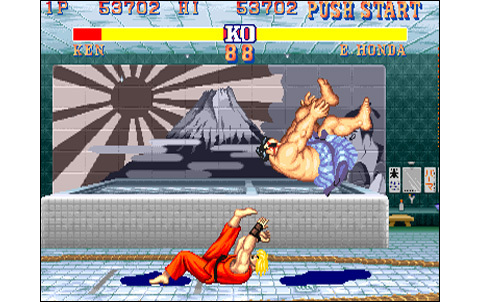 Street Fighter II was an exceptional game in its era, far ahead of its rivals and in many ways a pioneer! Oh sure, it packs a few flaws that have players smiling today. 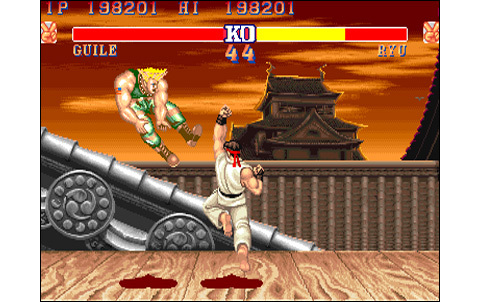 But the quality of its realization and the many innovations of its outstanding gameplay made it a benchmark in arcades, and a priority target for SNK and their Fatal Fury! A real benchmark back in 1991, among the most gorgeous graphics of the moment. Fast and quite smooth animation, with many steps. If the sound quality of the CPS-1 is sometimes not perfect, the themes are absolutely brilliant, the sounds of impacts are ideally chosen, and digit voiced are decent. 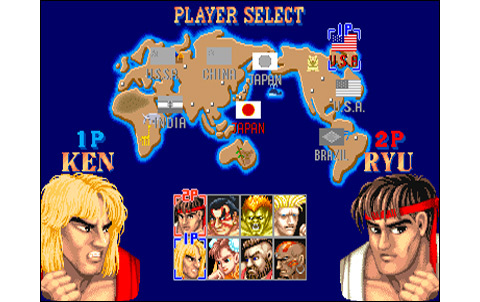 Eight selectable characters is the benchmark in 1991. Catchy for one player, ultra-addictive when playing with a friend! Revolutionnary. Never a game have proposed so much different moves, such smoothness and possibilities. 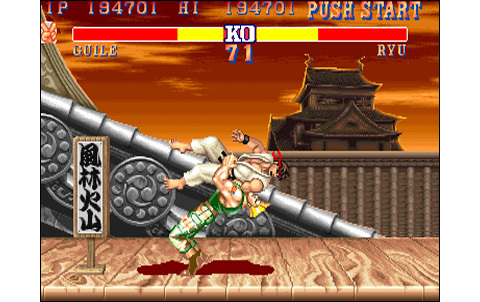 A classic hit, unforgetable for the aficionados of fighting games. Still looking good nowadays. So much titles to choose from! 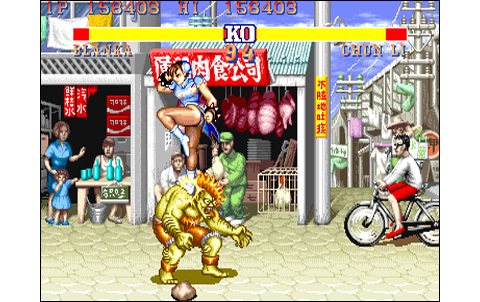 This said, to find back the old-school spirit of Street Fighter II, you have to pick among its contemporary titles: Fatal Fury, World Heroes, Art of Fighting are good choices. 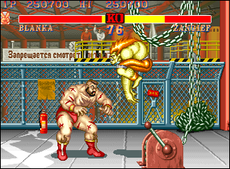 If you look for clones, check out Karnov's Revenge, Breakers or Fatal Fury 2.